My wife and I went to Harvest Restaurant, ＲＡＰＵＴＡ　ＢＯＴＡＮ, since it was 10 yen curry day today. 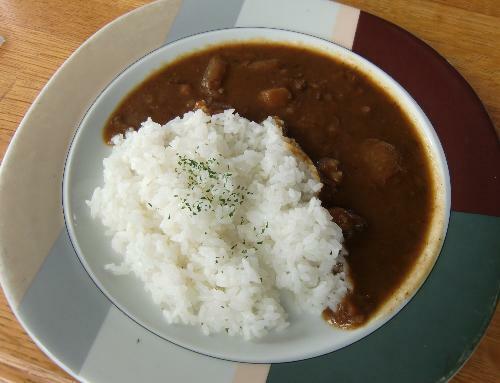 They serve 10 yen curry in the afternoon of the third Tuesday every month as a part of a volunteer activity. It was the first time in almost 5 months to visit there. The cheap and tasty curry and rice made us very happy ! It was cloudy due to the typhoon, but seeing Sakurajima from the restaurant was magnificent ! I want to go there again next month, if I have a chance. My boy friend is a left-hander.